description: The rhizome is erect with bunches of old stipe bases. Slightly scaled chestnut stipes are jointed near their tops and are one-fourth to one-third of the frond length. 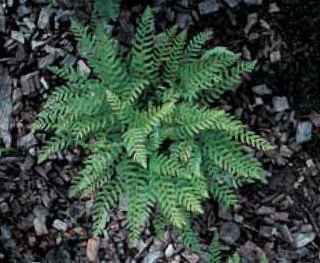 Soft green, somewhat hairy, once-pinnate blades are narrowly lanceolate with 6 to 12 pairs of pinnae. Upper pinnae are without stalks, one of the features that distinguishes this species from Woodsia polystichoides. The pinnae, with shallowly lobed margins, have a prominent auricle and flare gently toward the frond apex. Sori are marginal and encased, when young, in opaque, creamy, cuplike segments. range and habitat: This species is native to rocky crags in the mountainous regions of Japan, Korea, and China. Handsome when well grown, Woodsia ilvensis is an excellent but sometimes challenging dwarf for a rock garden collection, shown here in the peters garden. The miniature Woodsia intermedia showing its close visual and botanical relationship to W. polystichoides in the Stuart garden. 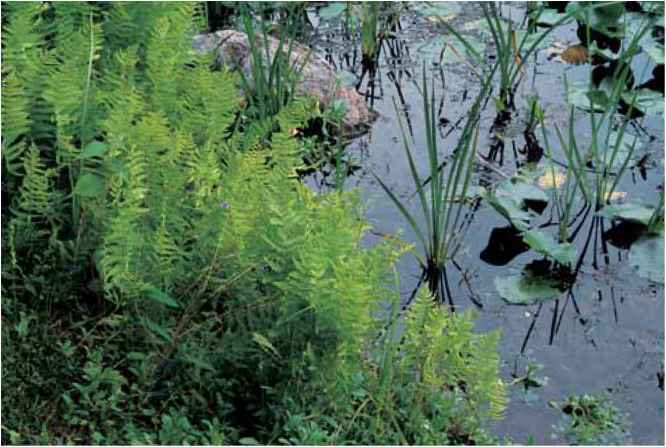 culture and comments: It is very challenging to distinguish this species from Woodsia polystichoides with their similar frond profile and habitat preferences. However, it is smaller in all of its parts and has fewer pairs of pinnae (6 to 12 compared to 15 to 25 for W.polystichoides). A perfect diminutive, W. intermedia prefers the gritty ground of rock garden surrounds and enjoys bright light and good drainage.